Before you even start thinking about plans for your amazing outdoor space, first think about your goals. Do you want this space to relax after a long day at work? Or will this be more of a space for the kids to play and grow? Maybe you’re looking for more room to entertain, or maybe you need an awesome grill pad for your BBQ parties. Whatever your goals are, it’s good to have them all worked out before you start the actual design. This will help ensure you end up with an outdoor space that’s cohesive, fits your lifestyle, and looks great. Once you know what you’ll be using your outdoor space for—whether it’s for entertaining, relaxing, or spending time with the family—take a walk around. Are there things in your backyard you’d like to keep, or are there things you definitely want gone? Maybe there’s an old, dead tree you’ve been meaning to get removed, or maybe you’ve always wanted to level out space for a pool. Taking a walk around your property with a clear goal in mind will help you decide what parts of your yard should stay, and what can be changed to give you the outdoor space you’ve always wanted. Another important consideration to make before you start any work is how traffic will flow. Where do you want to enter your new outdoor space from the house, and how do you want people to walk around the space? If you’re looking for a relaxing outdoor retreat, you might want an entrance from the master bedroom. If you want a place to entertain, it might make more sense to have an entrance from the living room or off the kitchen. The location of pathways throughout your outdoor space will have a big effect on the look and feel of the end product. Winding pathways are great for a meditational, relaxing outdoor space, while more straight lines make sense if you plan on carrying food from the kitchen to your outdoor dining space. Especially if you have a vast amount of land, it’s important to establish central focal points. This will make your backyard seem more visually focused, and like a well-planned, dedicated space, rather than a yard that’s a bit disorderly. If you have a larger yard, you might have an outdoor kitchen and dining area closer to the house. Or perhaps you may want to consider a firepit and seating area out farther with pathways linking the two. If you have a smaller yard, just one gathering place with decor strategically placed around the yard to make the space feel cohesive might make sense. Once you have a general plan for what you’d like to do with your outdoor space and how you’d like it to look, it’s time to start considering the physical additions and adjustments you’ll be making. A firepit is a perfect addition to any outdoor space. Whether you’re planning on hosting friends, or you like a nice quiet space to decompress after a long day, a fire pit provides the perfect gathering space, and the ideal location to curl up near the flickering flames. You can choose from in-ground and above ground fire pits to achieve the look you like best. A firepit that’s located a bit further from the house helps lend a sense of solitude and peace, a bit like a private retreat in your own backyard. Another thing to consider in your outdoor design is seating. If you’d like to entertain, you might like a designated seating spot with a roof, like a large gazebo or a covered space off the side of the house, so you can be outdoors even when the weather is less favorable. If you’re looking for more of a peaceful retreat, consider placing seating farther away from the home, in an area secluded by large plants or protected by a fence. Your seating options can really help invoke the feel of your space as well. If you’re going for a more rustic look, consider Adirondack chairs and reclaimed wood tabletops. A more modern feel might include brighter colors, stainless steel, and streamlined seating options. There’s nothing more soothing than the sound of rushing water. To add a bit of serenity to your outdoor space, consider placing fountains or bubblers around your yard. On a larger scale, a serene pool with beautiful landscaping and a small waterfall can invoke feelings of an oasis, taking you away from the stress of the day, and allowing you to relax in your space at home. If you plan on entertaining in your new outdoor space, nothing beats an outdoor kitchen. It’s the perfect way to invite guests to your home while taking advantage of the beautiful yard you’ve created. Outdoor kitchens allow you to experience all of the pleasures of home — a beautifully cooked meal, barbecued food, and a dedicated tabletop — with more room to entertain your guests, so no one feels cramped. It’s also the perfect way to enjoy beautiful summer nights, without being stuck inside cooking. Designing your outdoor space does take a bit of time, but with careful planning and the help of a custom builder you can trust to carry out your vision, you’ll end up with the outdoor space of your dreams. If you’re looking for a custom home with an amazing outdoor space, get in touch with Konkol. 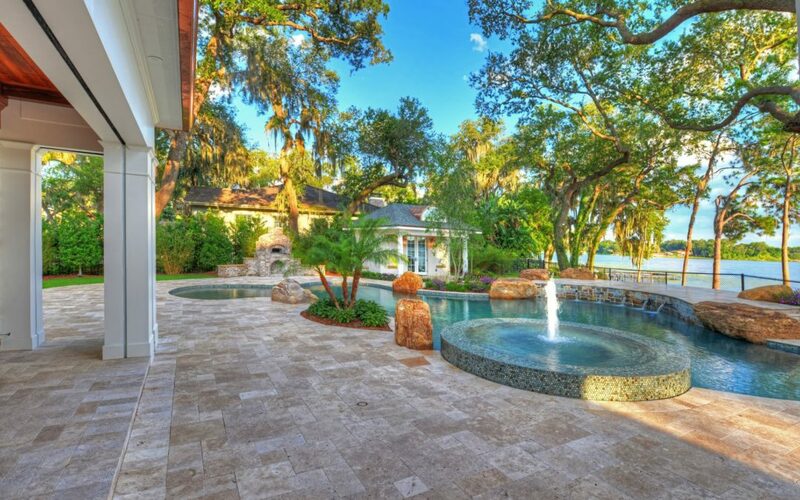 We’re a trusted luxury custom home builder in Central Florida, and we’re here to build a home that takes your breath away. Whether you want that gorgeous outdoor kitchen or a peaceful outdoor meditation retreat, we can help. Give our office a call at 407-466-3882, or contact us online to see how we can build your dream home, at your dream location.